Click on a play button. 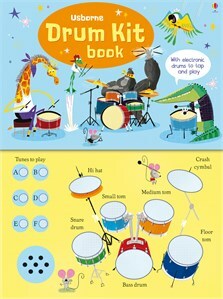 Learn how to play a drum kit by pressing the buttons in this exciting book. There are six different tunes to drum along to and seven drum buttons, including a snare, bass and cymbal, arranged in the shape of a drum kit. With links to Quicklinks to hear all the tunes and drum parts, this is a fun introduction for beginner drummers.